When you hear the words “antimicrobial resistance,” what comes to mind? This term may be a bit of a mouthful (you can also call it ‘AMR,’ for short! ), but don’t let the tongue twister throw you off. AMR is a growing worldwide concern that we should all know about. BD - Canada1, the Canadian subsidiary of Becton, Dickinson and Company, a global medical technology company, desired to understand and increase public awareness on this important topic. Working together with Leger, BD - Canada and NATIONAL developed a survey to find out how much Canadians know—or don’t know—about AMR. The results? It turns out, collectively, we’ve got a lot to learn. According to the findings, only 29 per cent of Canadians2 report themselves as “somewhat” or “very” knowledgeable about AMR. 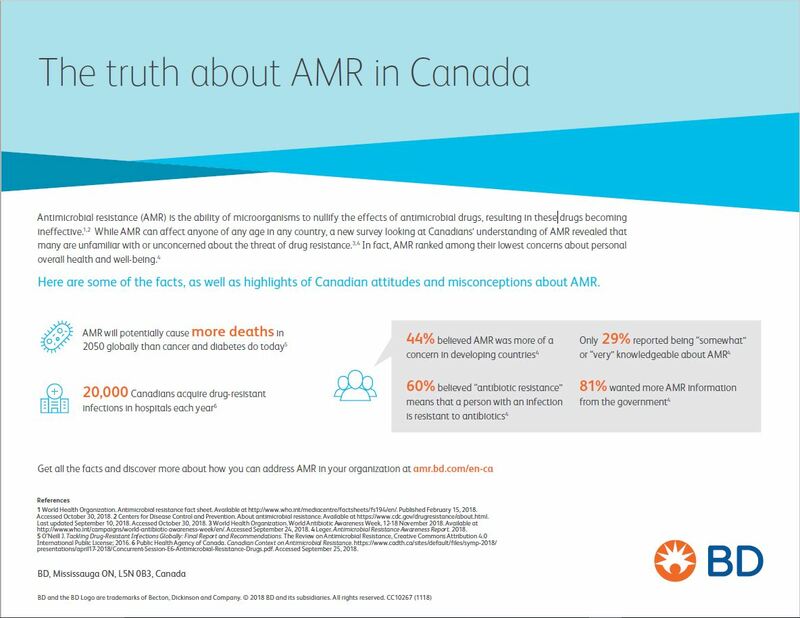 Furthermore, the results showed that Canadians upheld a number of misconceptions about what AMR actually means and whether or not it should be a point of concern. What is AMR, anyway? It’s when bacteria or other microorganisms (like viruses, fungi, parasites) evolve in ways that render antimicrobial medications like antibiotics ineffective. Resistant bacteria are also sometimes called superbugs. When medicines become ineffective, infections persist, increasing the risk of spread to others.3 But the survey showed the majority of Canadians are confused about this definition: 60 per cent2 mistakenly believe “antibiotic resistance” means a person is resistant to antibiotics. To help spread the word, and in acknowledgement of the WHO’s 2018 World Antibiotic Awareness Week, BD - Canada launched a campaign to share the survey results and provide more insights for Canadians. Between earned, owned, and social media, the campaign has garnered over 39.9 million impressions, and counting. Now that Canadians know a little more about AMR, what can we all do about it? Individuals can start by speaking to their healthcare provider about receiving the appropriate treatment for illnesses. Proper diagnostic techniques and antimicrobial stewardship can support appropriate prescribing and the identification of resistant bacteria as early as possible. To spread knowledge, you have to start by knowing where the knowledge gaps lie. With Leger and NATIONAL’s help, BD - Canada was able to understand more about exactly what Canadians didn’t know, and use this understanding to help educate and empower individuals by sharing information about this crucial issue. Okay, say it with me now: anti-micro-bial resis-tance. See? Not such a tongue twister after all. And now that you know what it’s all about, you can spread the word, too. 1 Becton Dickinson Canada Inc.